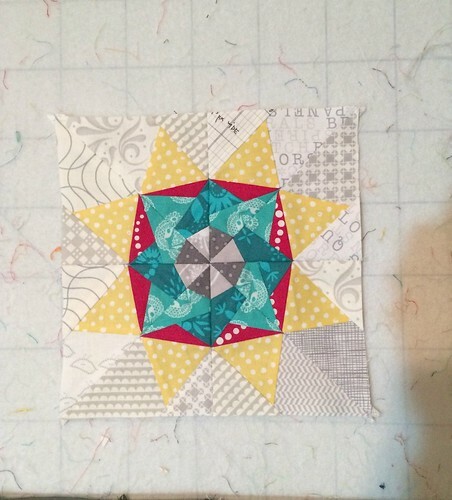 September's Lucky Star Block of the Month is the Echo Star, and if you're a subscriber, it's sitting in your inbox right now, ready for you to have some paper piecing fun this Labor Day. If you aren't, you can join in the fun any time right here! This is a simple A/B template block, perfect for some simple chain piecing, with just 8 pieces used to create the finished block. 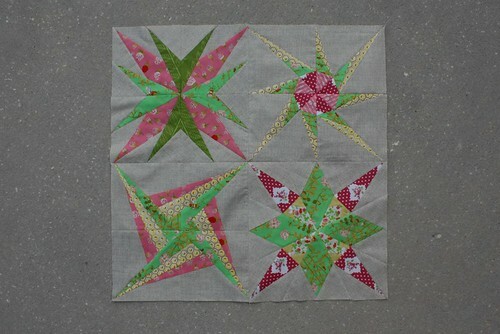 The block uses a little log-cabin-esque piecing method to create the different layers of the star. As always, you've got all the cutting information you need in the pattern, as well a fun coloring sheet so you can experiment with your coloration for the block. I think this block would be just gorgeous in a warm/cool rainbow effect! The Echo Star technically made its debut back at Spring Market in the Robert Kaufman booth with two other Lucky Star minis and somehow I never got around to sharing about them! The booth was just gorgeous, with loads of beautiful quilts done up in solids, and I was super excited to have a few Lucky Stars featured in the booth. These three little minis now travel with Robert Kaufman to shows and such, as they feature beautiful solids from Elizabeth Hartman's Designer Palette of Kona colors. Happy Labor Day to those of you who celebrate! It's summertime, and the piecing is easy - just a simple A/B template setup this month. No crazy sixteen pointed center, either :) Just a cool star with a lot of dimension - the Spunky Star. Can you tell I'm scraping the bottom of the barrel when it comes to pattern names?! 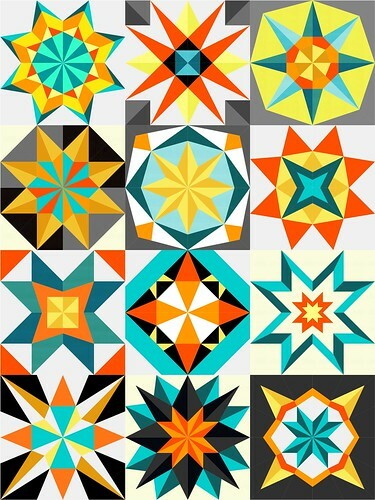 As always, if you have not previously been a subscriber to the 2014 Lucky Stars Block of the Month Club, you can always join up now and receive all the past block patterns, and then you'll also receive the remaining five patterns for the year as they are released, on the first of each month. If you're a Lucky Stars subscriber, this month's pattern should already be in your Inbox. If you're not, you can still join in the paper piecing fun by subscribing for this year right here. If you'd like to join for both this year as well as last year's patterns, click here. It seems like the weekends are flying by especially fast these days! Somehow it's Monday again, but I have a little something to brighten your day...Lucky Stars BOM subscribers, this block will be hitting your Inbox in the wee early morning hours tomorrow - it's the Daybreak Star, our star for the month of April. 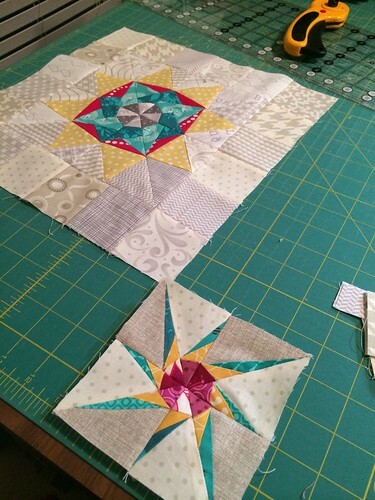 April's block is a four-template block, which allows us to add a lot of depth to the block. I played a bit with tonality in my block, sticking again with my original color scheme and adding different tones of my chosen colors to make the block have a shimmery effect. 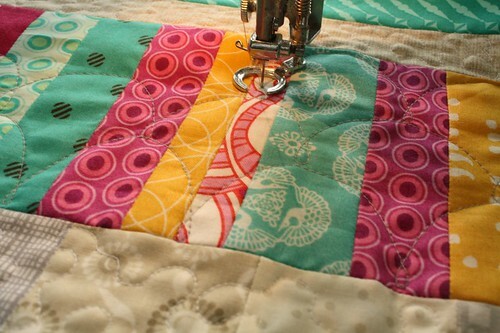 This block has a lot of seams coming together in the center, so don't forget to press both the wrong side of the block, as well as the right side, with a pressing cloth or scrap between your iron and your pretty, pretty fabrics. Remember that pressing is different than ironing - pressing means using gentle pressure with your iron rather than skating your iron over the surface of your project. With this block, you may want to use a little bit of extra elbow grease with your pressing to flatten things out nicely. Don't forget to tag your creations when you post them so all of the other Lucky Stars Block of the Month friends across the world can see them too! On Instagram and Facebook, add hashtag #luckystarsbom and you can tag me as well @dontcallmebetsy so I can see! On Flickr, you can add them to the Stitching with Don't Call Me Betsy Flickr group. I can't wait to see your interpretations of this block :) And if you're not already a Lucky Stars 2014 subscriber, you can become one at any point throughout the year - you'll get all of the blocks you missed, as well as the remaining blocks for the year. Happy Monday everyone! 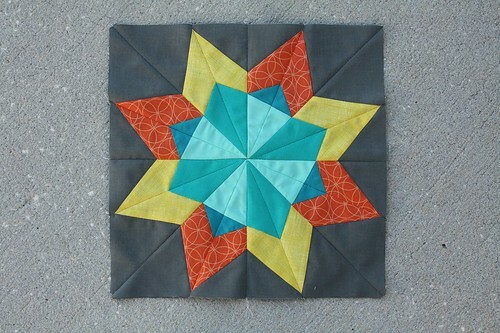 Every time I make a new Lucky Stars block, I wind up with a new favorite, and this one is no exception! 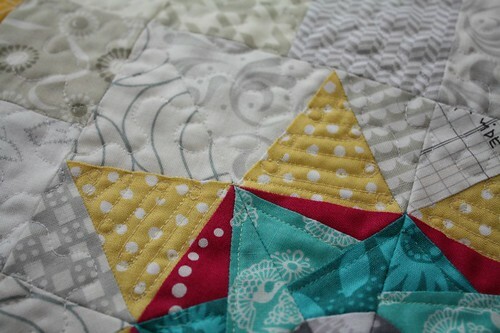 I'm seriously head over heels for this block and am hoping to make a few extra ones this weekend just for fun. 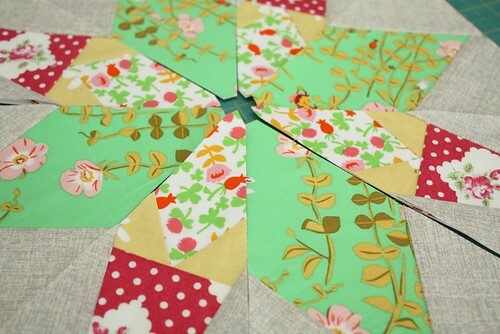 With just six pieces on each template, this is a paper pieced block that has an intricate look without too much fuss. I love blocks that are beautiful that come together quickly. Don't we all?! When I'm paper piecing, I find that the bulk of my time is spent in planning out the block and cutting fabric. Once I get to the actual piecing, I assemble my blocks using chain piecing, or the assembly line technique, which makes things move way, way faster. After I glue my first pieces of fabric to the un-printed side of all of my templates, I then piece all of my A templates, adding the A2 pieces to all four of my templates, trimming and pressing, then the A3s, and so on and so forth. Chain piecing when paper piecing also reduces my odds of making mistakes by placing all of a certain piece just right before switching gears to set up the placement of the next piece. 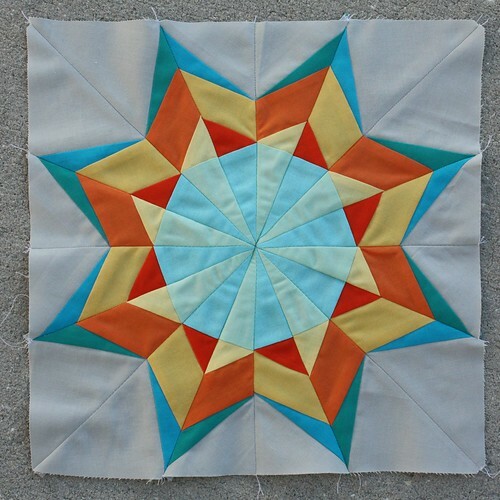 This block will go out to Lucky Stars subscribers first thing Saturday morning so you can spend your weekend paper piecing. Have a great day today! It's hard to believe that the last day of 2013 is upon us already. Where has this year gone?? It's certainly been a busy one, and the days have just flown by. So far, setting up my paper planner for 2014 is telling me that 2014 is going to be just as busy. There's some big stuff coming up, but for the moment I'm just feeling grateful for all of the wonderful things that happened this year...from my book coming out to my Juki joining my arsenal of sewing machines to expanding my teaching to finally getting myself down to a healthy weight to fun trips and great friends. It's been a great year, and I hope 2014 is just as awesome! 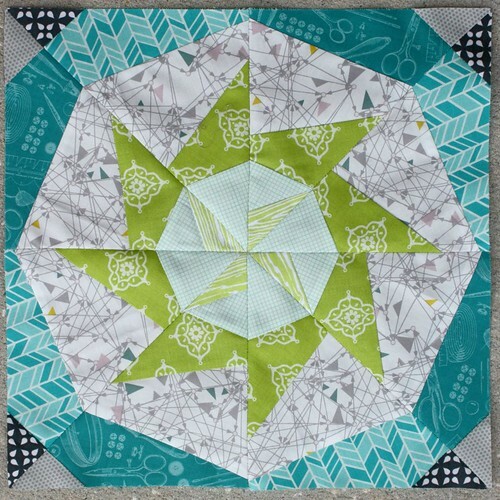 As the last day of 2013, today is the last day to get the 2013/2014 Lucky Stars Block of the Month Club subscription deal at $25, only at my Pattern Shop. Tomorrow, the clubs will officially be sold separately, for $15/each, and will not be available as a pair. The January block, the Sparkling Star, will be going out to subscribers this evening, in case you're kicking off the New Year in front of your sewing machine! I know that's my big plan for the night :) Have a safe and happy new year celebration tonight, everyone! I'm trying to be a little more focused with my color palette and fabric choices for my 2014 blocks - I'm going with a mix of grays for my background fabrics, and then aquas, teals, oranges, and yellows for the focal parts of my blocks. I think I'm going to work mostly with solids, which should be fun, but I couldn't help throwing in a fun print from Brigitte Heitland's Comma collection for Moda in this block. I think it just makes the block sing. I cannot wait to start seeing your interpretations of this block next week! Don't forget to tag your social media postings of your Lucky Stars blocks with the #luckystarsbom hashtag, and you can always add your blocks to the Flickr group too! 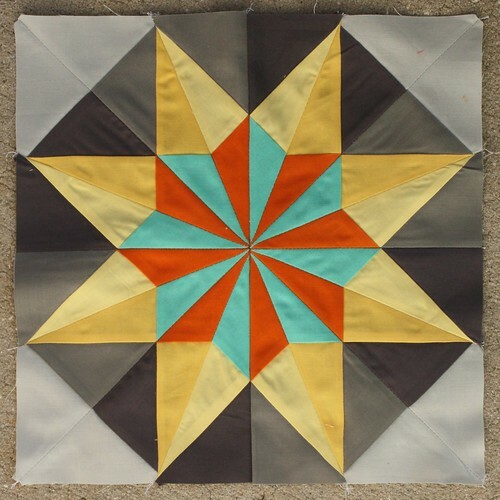 Lucky Stars December 2013 Block: The Encore Star - and a Cyber Monday deal! It's hard for me to believe that my Lucky Stars BOM has officially come full circle, having started last December. The final block of the 2013 club went out to members yesterday, and it might just be my favorite of the bunch. The Encore Star is another star within a star, with several different triangles swirling around the star. I think one of the reasons it's one of my faves is because of the mix of coral and navy within the block. It's quickly becoming one of my favorite color combinations! I also love that soft gray herringbone print from Willow that I used for the background, it's fantastic for a low volume background. I'm excited to start putting together a few layout options for this year's quilt, which will be sent to all 2013 subscribers in a few weeks. My Juki is off at the sewing machine spa at the moment, getting pampered and tuned up nicely, so I'm looking forward to getting it back and sewing up my quilt top soon. Welcome November! November happens to be one of my favorite months of the year - it's one of the few months of the year where the sweltering Florida weather usually starts to mellow out, but more than that, it's the start of the holiday season. I love Thanksgiving, though I tend to grumble a little bit about all the cooking and the cleaning that goes with Thanksgiving during the actual event, I do really love it. What about you? 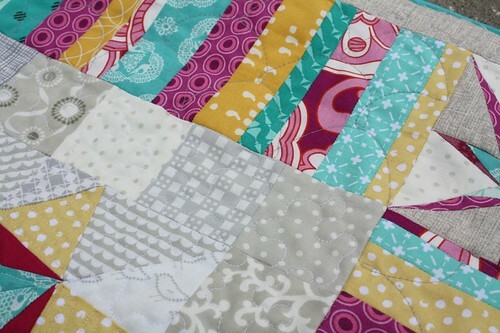 I love the way this block came together, from the fabric selections to the piecing. I'm really crushing on the way the stripes of the red AMH Innocent Crush fabric makes the block just sing. Definitely a great example of the right fabric in the right place - but honestly, I didn't have any idea that it was going to have such a big visual impact when I was picking out my fabrics, it just happened to be the exact right shade of red I was looking for! This block is officially on its way to all Lucky Stars 2013 members. If you have not yet taken advantage of the fantastic 2013/2014 deal, you've got just a few more weeks before that deal wraps up. Until November 15th, you can sign up for both the 2013 and 2014 Lucky Stars Block of the Month Club, totaling 48 block patterns, for just $25. Pretty amazing, right? To sign up for both, click here to be directed to my Pattern Shop. Have a wonderful Friday and a great weekend everyone! 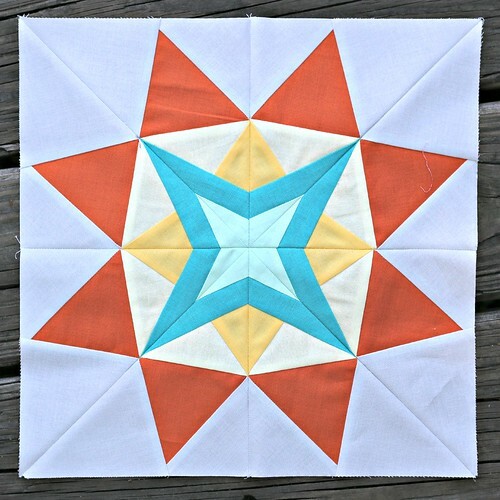 Announcing the 2014 Lucky Stars Block of the Month Club! 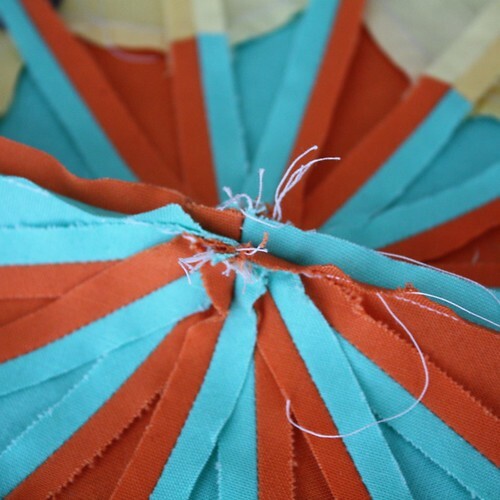 Have you gotten hooked on the fun of foundation paper piecing yet? 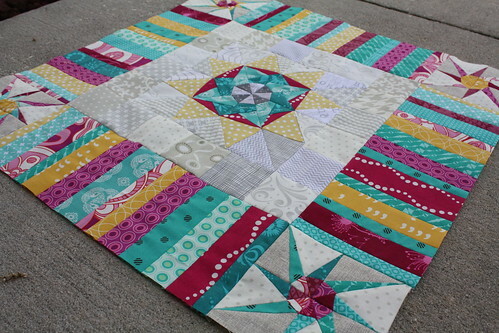 I've gotten a lot of emails over the last month or two about the Lucky Stars Block of the Month Club winding down. There's just two more blocks yet to come, and I've had lots of questions coming in about whether or not there are more blocks where these came from...and the good news is that there are loads more stars under my hat! 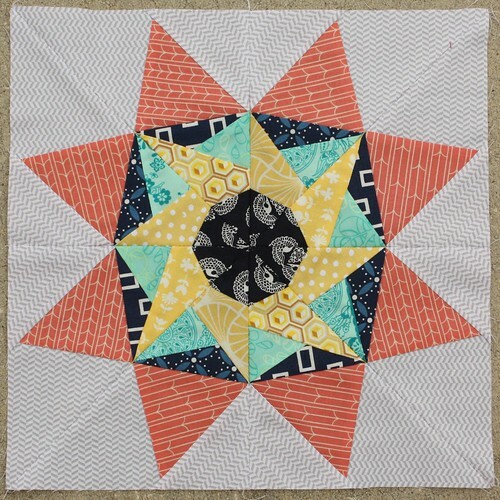 I spent some quality time this weekend picking and choosing 12 new stars for the 2014 Lucky Stars Block of the Month Club, and they are all ready to roll! To recap how things in the Lucky Stars BOM club work, club members receive the block of the month via email on the 1st of every month, beginning on January 1st. The monthly PDF patterns include detailed piecing instructions, with loads of photographs to illustrate the piecing, as well as block templates in two sizes for each block, for a 6" finished block and a 12" finished block. 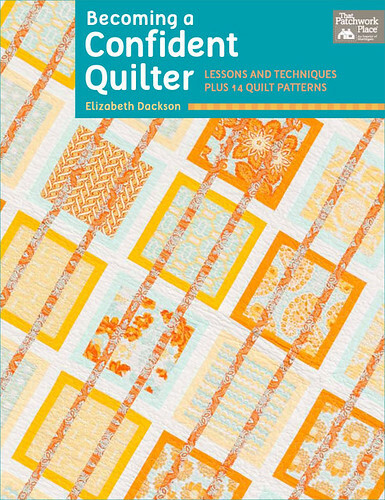 To subscribe to the 2014 club, you can do so at my Pattern Shop or my Craftsy shop. Current subscribers, you should have received an email from me this morning with a special discount code for you to use to subscribe to the new year of blocks. If you can't find it, let me know! If you were not already a subscriber for 2013, you can still join in the fun, as well as get a great deal on the 2014 club. You'll receive the past blocks within 48 hours via email, and then receive the remaining block on the 1st of each month. For just $25, you'll receive 48 foundation paper piecing templates - talk about a screaming deal! 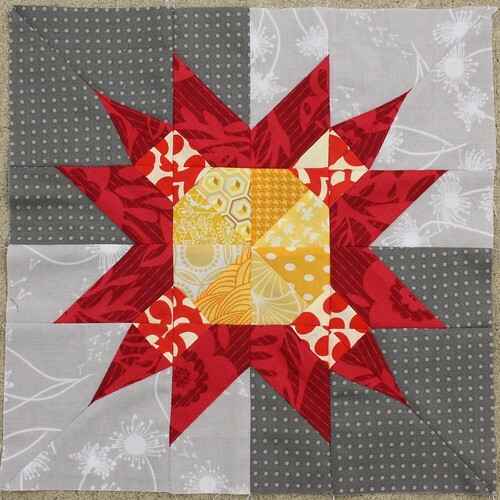 To check out some of the awesome blocks the 2013 subscribers have made so far, you can visit the Stitching with Don't Call Me Betsy Flickr group or on Instagram, check out #luckystarsbom. So...what do you say? Are you in for another year of paper piecing fun? Happy Monday to you! 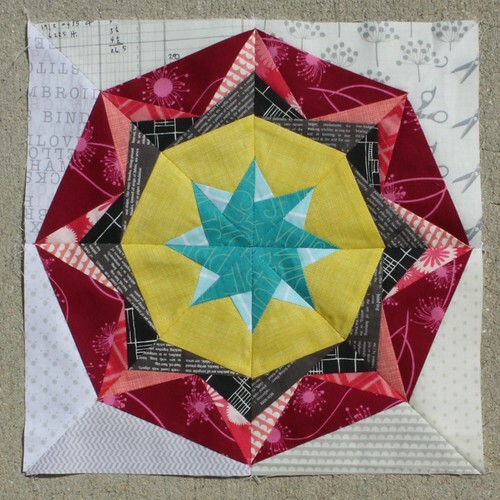 I'm excited to share October's block for the Lucky Stars Block of the Month Club, the Chaos Star. I really love how this one came together, but I have to admit, I spent quite a few moments questioning my fabric choices as I worked on piecing this one, but I trusted my gut and kept on trucking. I'm glad I did too - I wasn't sure how the outer ring would come together, with the dark cerise Flora and Fauna print with the assorted lighter pink prints, but I really like how they all work together to give a feeling of motion in that outer ring. I'm fairly sure I say this every month, but this month's star is one of my favorites! Club members, you'll receive this block in your Inbox first thing tomorrow morning. Congrats, ladies! I'll be in touch with you today to get your lovely fabric on your way to you! I hope you're enjoying working through the Lucky Stars blocks - or if you're collecting them for a rainy day, I hope you're enjoying that, too! We've got just two more blocks to go now, so I'm starting to think about 2014. I'm thinking of doing another block of the month club for 2014, I've had so much fun with this one, and there were many, many stars that didn't make it into this year's line-up, so tell me something - would you be in for some more stars with me? Happy Labor Day to you! I hope you're enjoying the long weekend, if you happen to have one. I've spent the weekend alternating between working and hanging out at the pool with my munchkin. The weather has been surprisingly rain-free the last several days, which is a welcome change from our typical summer weather here in Florida, where you can often set your watch by the afternoon thunderstorms. The nice weather sure has contributed to my spending zero time sewing so far this weekend. First thing Saturday morning, I went ahead and sent out the pattern for the Lucky Stars Block of the Month Club, knowing that many people would be spending this long weekend sewing. 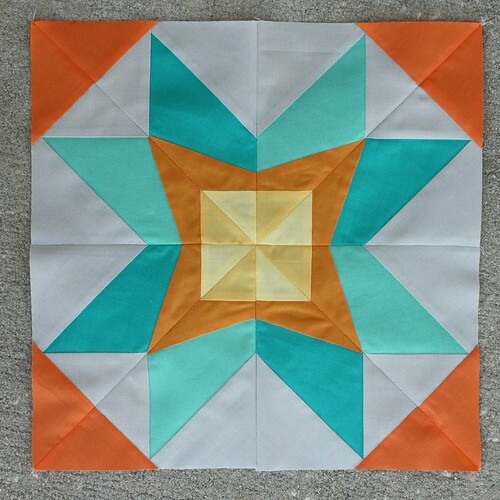 This month's star is the Windmill Star, a block I really enjoy. 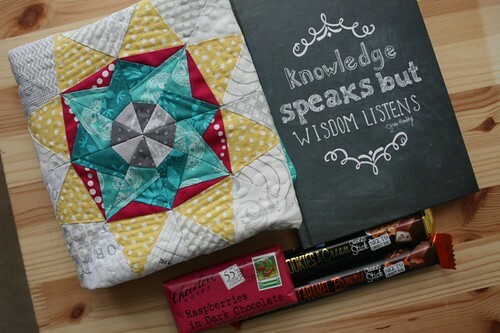 I'd really like to do an entire quilt in this block one of these days. 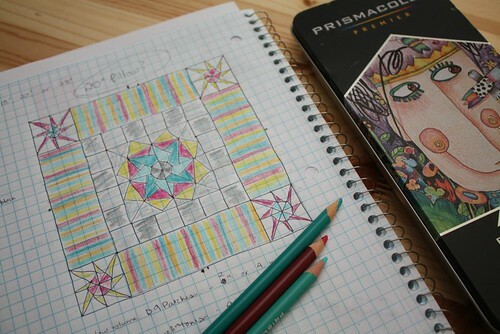 I suppose for now I'll just add that to my lengthy list of quilts I'd like to make! 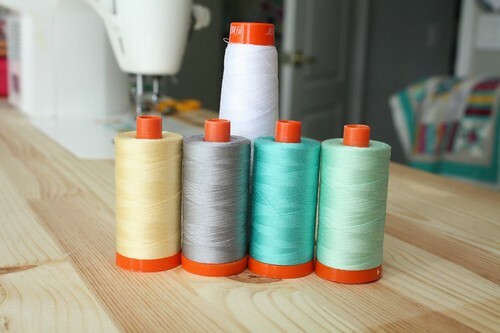 I'm hoping to get to dust off my lonely sewing machine and actually do a bit of sewing this week myself. Fingers crossed! Have a great rest of your Labor Day!